Meringue. When it’s made just right there’s something about it that seems so…ethereal…that’s the word. These “nests” are no exception and may very well be my favorite type of meringue. Crispy, crunchy on the outside, with just a bit of soft chewiness inside. 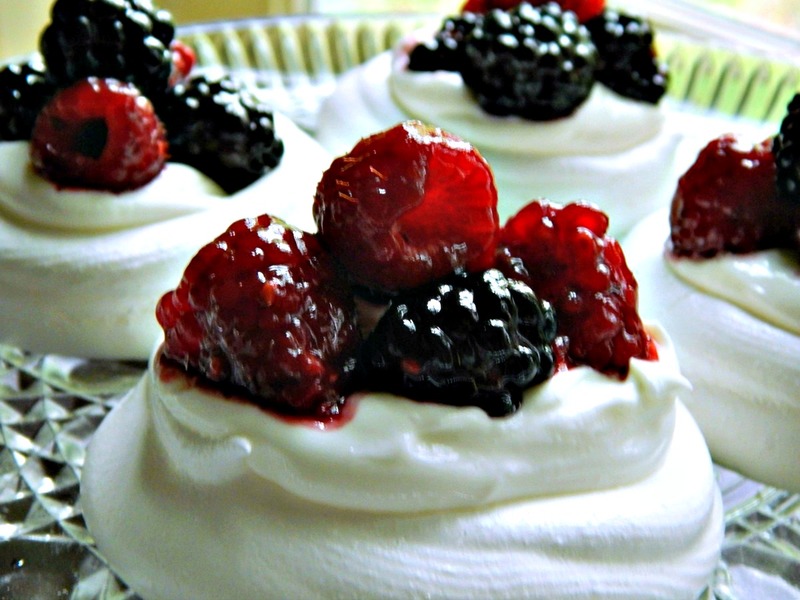 Meringue nests can be filled with just about anything your heart desires but today I chose a very simple yogurt and berry combination. Now look at these and tell me if you’ve ever seen a spoonful of yogurt and a few berries look so delicious! When I’m feeling fancy I might add a little sauce; today I melted a tablespoon of jam and tossed it with the berries just to give them a little glisten. Not only are these Meringue Nests pennies to make, “nests” of this size use three eggs, the perfect amount for the left over whites from the Chicken with Lemon and Artichokes I made earlier. That recipe uses three egg yolks, and you know I don’t want to waste those whites! Meringue is easy to adjust up or down. The rule of thumb is 1/8 teaspoon of cream of tarter for every two egg whites and four tablespoons of sugar for each egg white. Preheat oven to 200 degrees. On a pastry sheet, draw 8 circles, each spread out evenly with spaces between them, using something measuring three inches in diameter as a template. If your parchment is larger than the sheet, make sure you take this into consideration as your draw. Draw heavily enough so that when the parchment is turned over you’ll be able to see the lines. Place parchment on baking sheet before you pipe. If your parchment is curling, add a dab of meringue to the corners of the baking sheet to “glue” the parchment down. Optional, but recommended: If you have food processor or nutribullet or some other item that easily grinds food, add the sugar and process for a few seconds. This breaks down the sugar finely and helps to make a smoother meringue. Wipe the bowl of an electric mixer and the whisk attachment with a clean towel or rag dampened with vinegar or lemon juice to remove any possible traces of oil or butter. Add egg whites (free of any traces of yolk) to the mixer bowl. If the whites aren’t already at room temperature, leave until they are or place bowl in warm water for at least 15 minutes. Mix on low-speed, preferably with a whisk attachment, until egg whites become frothy, about a minute, then add cream of tartar. Increase speed to medium-high and beat until soft peaks form, about one to two minutes. Gradually add the sugar and beat on medium speed until sugar dissolves. Turn up to high-speed until stiff peaks form. Stiff peaks means that the peak will hold straight up and not bend over when the whisk is lifted out of the mixture. When you run a little of the mixture between your fingers, the sugar should be dissolved and little to no grittiness should be felt. Fill the pastry bag or Ziploc bag and working from the center of each circle, pipe the meringue in circles until the circles are full and build up the sides with one or two turns around. Bake until completely dry and crisp, but not browned, about an hour, although this can vary depending on the weather and the oven. Nests should lift from parchment with ease. Turn off oven and prop the door open about an inch (a spoon is a good implement to use) and leave for an hour or until completely cooled. These little nests turned out to be the perfect dessert for the Lemon with Chicken and Artichokes – the recipe that used three egg yolks. I did think about how lovely these nests would be filled with lemon curd, though, if I hadn’t already used the yolks. This entry was posted in Click here for Fabulous Food Posts and tagged Desserts, Easy Recipe, egg whites, Eggs, Frugal Hausfrau, meringue. Bookmark the permalink. I’ve never been a huge meringue fan either but these little nests would make me change my mind, and that chicken artichoke dish looks amazing! Thanks, Julie! The chicken dish is such a long standing favorite and I just hate having leftover whites! One or two I might sneak into scrambled eggs, but three? Great post! Those look awesome. I haven’t worked with meringue nests in a long time. Forgot they take an hour to bake. Talk to you soon. Quinn, some of those I served these to were young people – they asked how I got the marshmallow to do that, which I thought was cute. I think they may have been LESS impressed when they learned it wasn’t marshmallow! Oh Jhuls, you can make anything! I’ll tell you what, I’ll trade you some for a few of those chicken balls you brought to fiesta friday!!! Deal? I love meringue nests, but the one time I attempted making them they were a complete flop. After reading your tips and step by step instructions I’m thinking maybe I could be brave enough to try them again! I’m sorry to hear that! If you do decide to give them another try, feel free to ask any questions! I think as long as you beat until really stiff it’s hard to go wrong. And don’t bake them on a super hot, humid day. It was raining when I made these, but it was cool and not too humid. Wow, thanks so much! That’s so lovely to hear! I think they’re a bit “old-fashioned” but they are so much fun to make and serve! Mmm wow these look sooo good! I love meringue and these look so pretty! Thanks, Angie! LOL! Putting dessert before dinner…I love a woman that has her priorities straight!!! These look quite impressive-nice job! Didn’t bother piping the meringue though and then I topped them with a combo of whipped cream/blood orange curd and decorated with raspberries and blackberries. Posting later today or tomorrow. Fun! I I had to laugh because at first glance I thought you said psycho sister! LOL!! The blood orange curd sounds amazing! 🙂 I’ll save ya some!